Watching The Dark Knight Rises while sick inspired today's workout. In the flick, Batman has just been pummeled by Bane and had his back broken. Now locked away in a remote prison to suffer, an inmate punches Bruce Wayne in the spine to reinsert a disc. Fueled by anger, Wayne begins to mend and starts a prison regimen of pull ups, push ups and sit ups to get back in fighting shape. 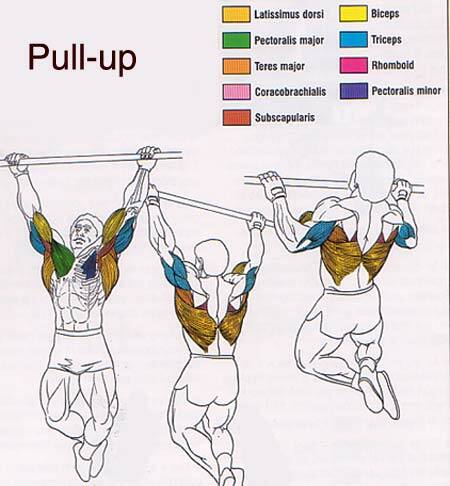 Technically a Pull Up uses an overhand grip (knuckles facing you) and work more of your back/lats and shoulders while Chin Ups are underhand (palms facing you) and use more bicep. I think it's a pretty stupid distinction to make because variety is a spice of life and training. If you're only doing Chins with one grip, you're hurting your own physique. Pulls are a smidgen safer since there's no pressure on your wrists like a Chin. But you only have to worry about that if you have sloppy form and are flaring your elbows out. Hands Parallel is the ultimate no wrist impact position though. So why not do all three? That's what my session entailed, hands wide, shoulder width, close with an overhand grip, then the same three repeated with an underhand grip, finally it was two sets of parallel grip wide and narrow. If you make the effort to pull to your chest, the pecs and delts get more involved as do your abs. They say the average male cannot do one chin, that's not surprising because how often do people even think of doing them? They probably harken back to some kind of bad high school memory of gym class. But chins are one of the best exercises you can do as they work your forearms, biceps, shoulders, core and chest. If you can't do one yet, no biggie. I started out struggling to do one as a sophomore in high school and built my way up to doing 135 in one workout. It just takes time and persistence, if you can't do a full chin, then use a chair and step into the top position and lower yourself down, controlling the movement. In college, I installed a chin up bar in my apartment and took Arnold's advice and did 50 chins on a given day. No matter if it was 50 sets of 1 or 5 sets of 10, I just got to 50. Push Ups can have the same variety, hands wide, shoulder width and close, fingers facing each other, fingers out, hands staggered, on knuckles, etc. You can work your chest, shoulders and triceps with just a changing of hand position or putting your feet up on a chair. Keep your elbows tight to avoid shoulder strain and to keep the pressure on the muscles you're working.